You guys know I'm still layering right? #layersalldayeveryday. The most used items in my closet are my long vests (yes, I own two - which, coincidentally are both dresses and I wear them open or backwards). 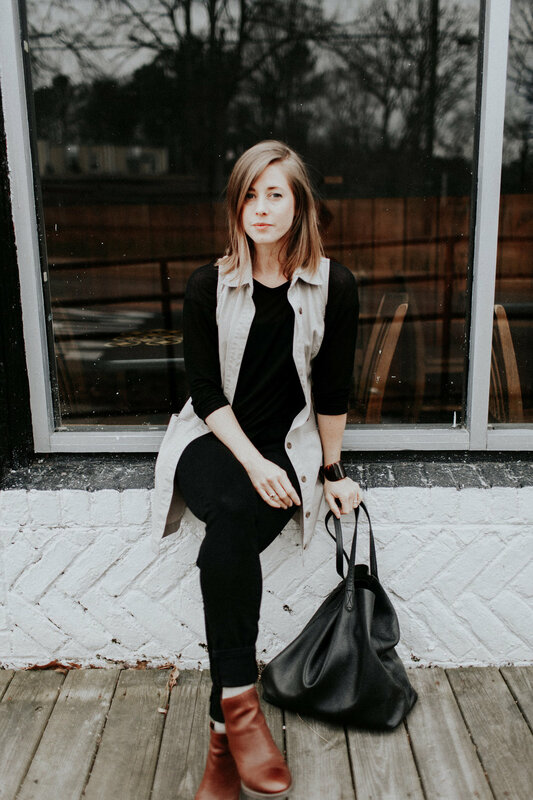 I am a strong advocate for the long vest if they fit your own personal style schemata - they are super functional and add a very easy layer to nearly any outfit. Other items of note: my trusty black leather Cuyana bag that I purchased about 2 years ago and still looks new. I recently reviewed a Neely and Chloe bag and while I LOVED the bag (the color, the details!) I quickly realized a tan/light colored leather bag was NOT gonna cut it for my lifestyle. Give me a black bag (and clothes) and let me beat the heck out of 'em (plus they don't show all the coffee and food spills! ).